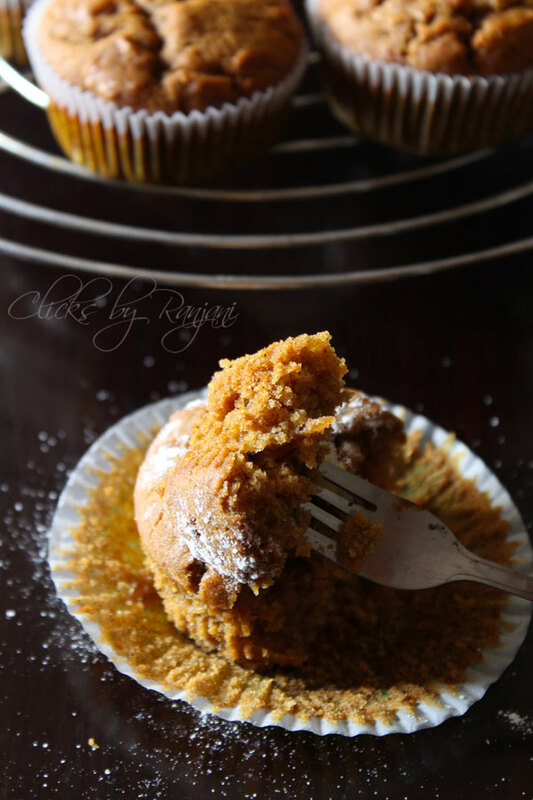 Wheat apple cupcake recipe – An apple cupcake with jaggery that too with wheat flour. So it will completely work out on your diet schedule, isn’t it? Yes, it has low calories so you can take it as your breakfast or evening snack with a cup of coffee. I found this recipe in Beulah’s full scoops. I always inspire her baking and am sure most of my trials from her is no fail recipe. 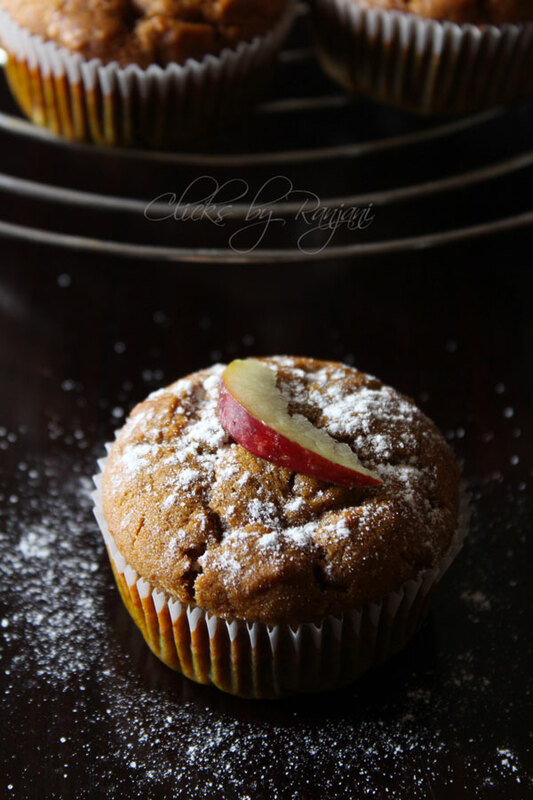 I really loved the cinnamon and nutmeg flavor in this eggless apple muffin. Trust me its super easy to try. Pre-heat oven for 10 mins at 180-degree celsius. Soak ½ cup jaggery in ½ cup water for 15 mins. Mash and filter to remove impurities. Keep the syrup in a bowl to mix with dry ingredients. Peel apple and grate. Measure 1 cup grated apple and keep aside. In a mixing bowl, add jaggery syrup, vanilla essence, and refined oil and whisk well to mix all together. Sieve directly or separately the dry ingredients, wheat flour, salt, cinnamon powder, nutmeg powder, baking soda and baking powder together. Fold the mix gently using whisk or spatula without any lumps. Finally, add grated apple and give a gentle mix. Take a muffin tray, line with muffin cups and half fill with the batter we prepared. Place it in preheated oven and bake for 20 to 25 mins. Check by inserting a fork or wooden toothpick to check the cupcakes are fully baked. If it comes out clean, the cupcakes are done. 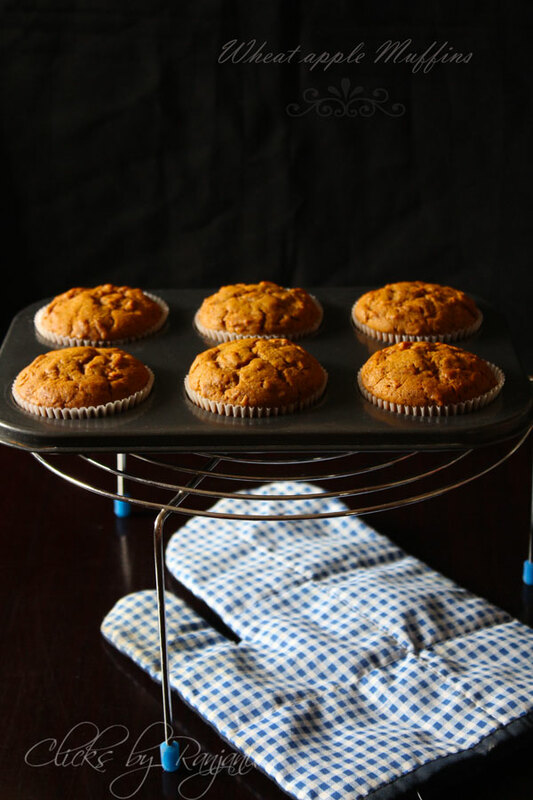 Cool on wire rack for 10 to 15 mins and serve with frosting or simple sugar powder. 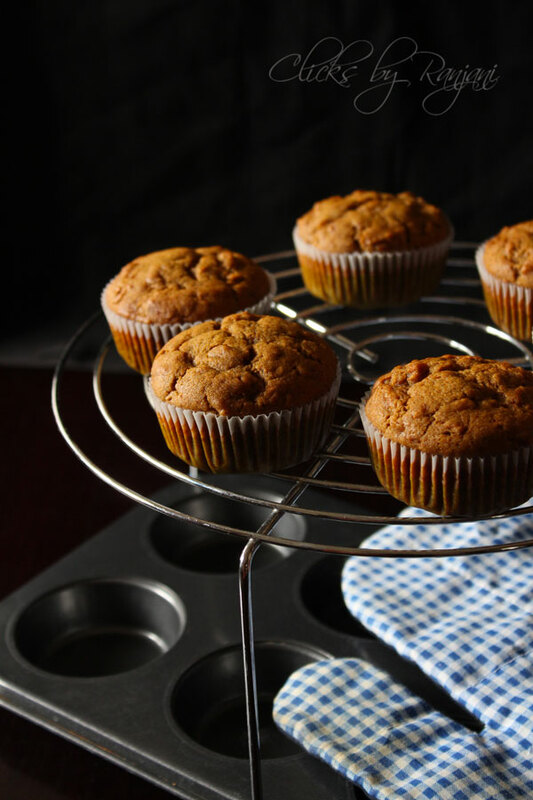 You can use any brand wheat flour for these cupcakes. It’s better to remove the skin and use the apple. The shelf life for these cupcakes is one day. It is best to make fresh and serve the dish. The oven temperature will vary from brands. Hi deethi.. explore the ingredients section to see the quantities.. The ingredients are not given in proper measurements. Need the measurements of wheat flour, r efined oil, baking powder, baking soda for this wheat apple cupcake. Can we use any other oil instead of refined oil. you can see ingredients in left side of your screen in the recipe page ,if u r using lap or desktop.for mobile view, you have explore the + icon in ingredients to see the measurements.And you can use any oil instead of refined oil.